24/7 access to the funds in your checking account. Using a VISA® debit card gives you 24/7 access to the funds in your checking and savings account. Funds are deducted directly from your account which helps make keeping track of what you spend a breeze. Shopping couldn’t be easier! 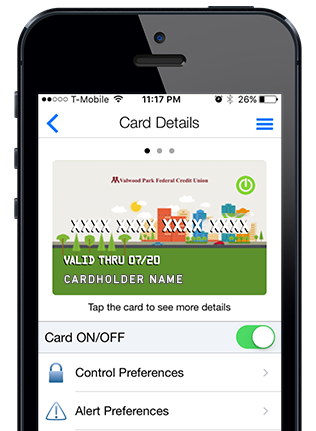 When you use this card, your purchases will automatically debit your checking account. This card is available for checking and for savings account members. 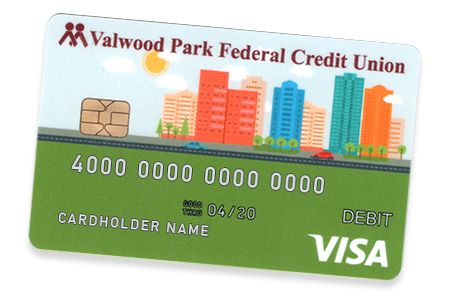 Control of your Valwood Park Federal Credit Union Debit Card card right from your smart phone. Learn more about our home banking and apps! You can immediately get 500 Award points until 3/31/18 just by signing up to participate in the program! Earn everyday points! 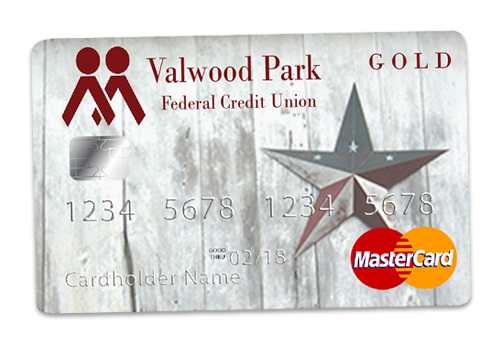 Simply use your MyRewardsPlus - Valwood Park FCU card for all your everyday qualified purchases and earn points! From groceries to fuel to utility bills, your purchases will really pay off. Claim your 500 award points! Remember, with a DEBIT CARD, you can get “Cash Back” with NO FEE at most participating grocery stores when you check out. To apply for the MasterCard Credit Card , please download the application form and enter the requested information. Then print and FAX to us at: (972) 245 – 6783. Please do not EMAIL forms to us due to internet security risks. As of May 1, 2015, there will be a $1.00 monthly fee for members that have a debit card, and only have a savings account, unless the minimum aggregate balance in the account is at least $5000.00 during the entire month. If you are going to be using your card more than ten times in a 24 hour period, please call us so that we can determine if we need to notify the network. Remember, not all merchants report debit card transactions in ‘real time’. So, there could be a ‘hold over’ from the previous day. This could make it appear that you are trying to use your card more than ten times in a 24 hour period. Also, some merchants ‘pre-authorize’ the transaction. This ‘pre-authorization’ shows up as a transaction, even though it does not actually process thru the system. This means that the number of transactions you have left for a 24 hour period is reduced by the number of ‘pre-authorized’ transactions.